"It’s exciting bringing this kind of organizational system to market, because this is something I haven’t seen in my 20+ years,” mentioned Jim. 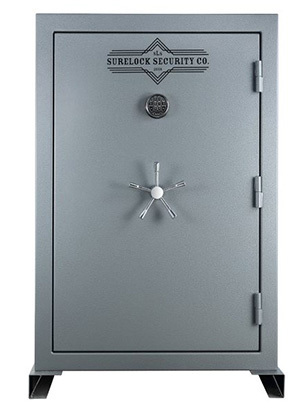 “The organizational capabilities of the Constitutional Cabinets, and the heavier gage steel, for the 60-90-minute safes, are both welcomed additions to the industry,” said Jim Heeren, Product Development and Sales Manager, SureLock ™. Jim Heeren has been in the industry for 22 years and previously spent 21 of those years working for Cabela’s as a merchant in the category (Gun Safes & Cabinets). Heeren has helped SureLock™ Security proudly develop and offer four different series of safes with anywhere from 30, to 90-minute fire ratings with 14 to 11-gauge steel construction. Keep reading for specs and information on the four available series, as well as the patent pending Constitutional Cabinets. Stay tuned for more new and exciting product releases to come! Constitutional Cabinets (Patent Pending) SureLock Security Constitutional Cabinets are tactically and innovatively designed to protect what you value most. Each cabinet is crafted with exclusive features, like our patent-pending EasyAccess™ organization system. This industry-leading design virtually eliminates the need to remove all stored items to access equipment stored in the back, or bottom areas.Our easily maneuverable, 7 – 14 long gun vertical pull-out storage drawer(s) are each equipped with a smooth glide support roller, that has the ability to hold up to 150 pounds. The high-density, adjustable barrel rest provides spacing ridges to prevent damage, allowing you to safely store your guns with scopes attached. No overlapping, no scratching, no stacking. The Constitutional Cabinet series includes our unique SecureCharge™ system which discreetly allows for electricity cords to power an interior light, de-humidifier, or charger securely inside the safe through a small access port in the back side of the cabinet. SureLock cabinets are secured by a state-of-the-art electronic digital lock with a customizable 6-digit combination and optional backup key. Stay protected, stay organized, stay secure, and stay sure - with SureLock. The SureLock Security Company Cadet Series Gun and Home Safes provide maximum security, for all of your valuables, at an affordable price. The Cadet Series comes with a matte tan exterior finish, as well as a tan interior that has a customizable gun rack and adjustable shelving. The exterior includes a black SafeLogic BackLit digital lock and three spoke handle. Be sure with SureLock, and protect what can’t be replaced. Backed by the SureLock Securities Lifetime Replacement Program, the Cadet Series Gun and Home Safe is the dependable choice to securely protect all your treasured possessions. SureLock cabinets are secured by a state-of-the-art electronic digital lock with a customizable 6-digit combination and optional backup key. Stay protected, stay organized, stay secure, and stay sure - with SureLock. The SureLock Security Company Colonel Series Gun and Home Safes provide deluxe security features for protecting all your valuables, with options ranging from 35 to 64 gun capacity safes. The Colonel Series comes with a charcoal gray exterior finish, as well as a light grey interior that has a customizable gun rack and adjustable shelving. This Series also has a 75-minute fire rating, providing excellent protection should a fire occur. The exterior includes a black SafeLogic BackLit digital lock and five spoke handle. Be sure with SureLock, and protect what can’t be replaced. Backed by the SureLock Securities Lifetime Replacement Program, the Colonel Series Gun and Home Safe is the dependable choice to securely protect all your treasured possessions. 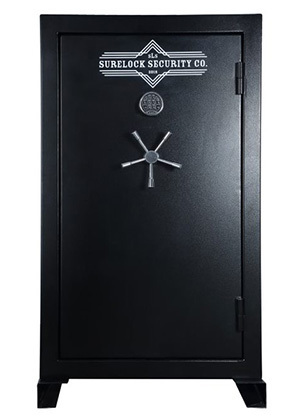 The SureLock Security Company General Series Gun and Home Safes are the ultimate option for fire protection, and provide deluxe features to protect all your valuables. The General Series comes with a black gloss exterior finish, as well as a light grey interior that has a customizable gun rack and adjustable shelving. This Series has a 90-minute fire rating, providing excellent protection should a fire occur. The exterior includes a black SafeLogic BackLit digital lock and five spoke handle. Be sure with SureLock, and protect what can’t be replaced. Backed by the SureLock Securities Lifetime Replacement Program, the General Series Gun and Home Safe is the dependable choice to securely protect all your treasured possessions. “We are blessed to have Jim leading our development team and look forward to seeing the growth potential and innovation we can offer to this market and its consumers,” stated Jeff, President of Dansons, when asked about adding Jim Heeren to the team.